As the first stage of Egypt’s constitutional referendum draws to a close, a resilent yet pensive mood was palpable among many voters. This contrasts with Egypt’s previous post-revolution referendums and polls, during which most voters could be seen smiling and proudly showing off their ink-stained fingers to news cameras. Most voters who spoke to Ahram Online on Saturday expressed fear that, regardless of the outcome of the current constitutional poll, the coming period in Egypt would be ridden by political conflict and strife. "There will be no stability in any case; this is a process that will take a long time," said one voter in the capital’s Old Cairo district. Divisions between supporters of President Morsi and the opposition run deep; in some cases, fistfights erupted outside polling stations between members of Egypt’s two rival camps. In addition to several reported violations, with some polling stations closing their doors much earlier than scheduled, many voters expressed frustration with the long lines and insufficient numbers of judges to supervise balloting. Some voters expressed the belief that voters were intentionally made to queue longer than necessary to dissuade them from casting their votes. A few hours before the closure of polling stations nationwide, Supreme Electoral Commission (SEC) Secretary-General Zaghloul El-Balshi said that some 50 per cent of the 25 million registered voters in the ten governorates that cast ballots in the first phase of the poll had already voted. The poll was largely trouble-free, but violence erupted late on Saturday when the Cairo headquarters of the liberal Wafd Party was attacked by unknown assailants. It remains unclear whether the attack was related to the constitutional referendum. Mohamed Tharwat, managing editor of the Wafd Party’s news website, pointed the finger at prominent Salafist preacher Hazem Abu-Ismail, but the latter quickly denied any responsibility for the attack. Ahram Online now begins the second leg if its live updates. We willl bring you the referendum's results, as they trickle in throughout the night. 22:55 Salafist preacher Hazem Abu-Ismail vehemently denies that his supporters had attacked the headquarters of the liberal Wafd Party on Saturday night as polling in the first first phase of the referendum on a proposed constitution approached the 11pm closing deadline. "I know nothing about any riots or any attempts to lay siege to any headquarters. Blaming me for that is media farce. It's obvious that the media is targeting me," the one-time presidential hopeful said on his Facebook page. 22:40 Secretary-General of Egypt’s Supreme Electoral Commission Zaghloul El-Balshy says he has “no information” about preliminary polling results. "Nobody informed us of any results. If there were any electoral violations, the commission will convene and take the appropriate steps," El-Balshy said in a phone interview with the CBC television channel. Meanwhile, Al-Ahram's Arabic-language news website reported that the polling station in the Omar Ibn Al-Khattab School in the Nile Delta’s Sharqiya governorate had announced - before 9:50pm - that some 70 per cent of votes cast had endorsed the draft constitution. The Muslim Brotherhood's Freedom and Justice Party, for its part, has already announced some of the results before polling stations have officially closed. Preliminary results have been announced in several governorates - including Sharqiya and the Upper Egyptian governorates of Assiut and Aswan - before polling stations had officially closed at 11:00pm local time. 22:30 Some 500 supporters of prominent Salafist preacher and former presidential candidate Hazem Abu-Ismail attacked the headquarters of the opposition Wafd Party on Saturday night, according to Mohamed Tharwat, managing editor of Al-Wafd news website. Tharwat told the Hayat television channel that attackers surrounded the building, located in Cairo's middle-class Dokki district, and sprayed it with fireworks. "They destroyed the windows at the building entrance, but didn't enter the building," he said. "Abu Ismail's supporters later clashed with Central Security Forces [CSF], who evacuated the area." He added: "I hold President Mohamed Mori responsible for what the [Wafd] party has suffered." Eyewitness Omar Said, an Egyptian reporter for Lebanon's Al-Safir newspaper, said that attackers broke into the building and beat up journalists and Wafd Party members. As of 10pm local time, Said also said the assailants were still locking horns with the CSF in adjacent streets. "All the attackers are bearded," he told Ahram Online. Abu-Ismail supporters, known as 'Hazemoun,' have been holding a sit-in at Egypt's Media Production City in Cairo's 6 October City district to protest alleged media bias against Islamist figures and groups in the run-up to Egypt's contentious constitutional referendum. 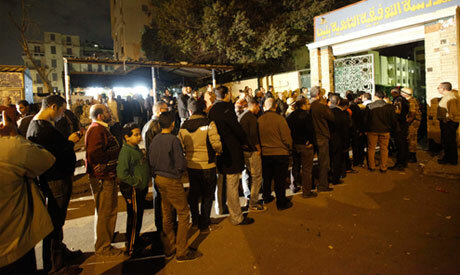 21:20 Soha Samy, a 29-year-old communications specialist, told Ahram Online about the tensions she witnessed inside the polling station at the Abbas El-Akkad School in the east Cairo district of Nasr City. “A woman came out shouting hysterically that the ballot she received had been pre-marked with a ‘yes,’” Samy said. “What’s more, many people here are suffering from overcrowding,” she added. “There aren’t two different lines for men and women, and no space for the elderly or for women with babies to pass. Moreover, the electricity has been cut,” she added. 20:56 Ahram Online’s Randa Ali reports that the polling station at the Ebtidaiiya Al-Gadida School, located in the working-class district of Sayeda Zeinab, was temporarirly closed after voters suspected rigging and limited violence broke out. Angry voters said judges had stopped stamping ballot papers after seeing an increase in ‘no’ votes. Altercations occurred later in front of the polling station. Military personnel eventually stepped in to restore order. The polling station reopened again after a 20-minute interval. Many old men, who are planning on voting ‘no,’ are now getting angrier about waiting too long to vote; some are warning they will soon leave and tensions are running high. The judge at El-Imam Ali polling station judges, who refused to give his name, said that people are dissatisfied with the voting this time because many polling stations were combined together into one. “In the last elections there were 1,500 voters registered in my station. This time there are 6,700; this number needs at least 3 days for voting. Despite the long wait outside things are running very smooth inside the room,” said the anonymous judge. The judge added that despite the decisions of most judges not to supervise the voting, he still took up the task out of professionalism. 20:20 SEC head Zaghloul El-Balshi says that some 50 per cent of the 25 million registered voters in the ten governorates casting ballots in the first round of the constitutional referendum (out of a total national figure of 51 million) had turned out to cast ballots. 20:10 After unconfirmed reports from Alexandria that 18 polling stations had been shut (later refuted by the SEC), Ahram Online's Bel Trew spoke to Mahienour El-Masry from the Revolutionary Socialists in Alexandria about the current situation. "At the moment, women are sitting on the road in the Roushdy district, blocking the street to protest the fact that they have been trying to vote since 12pm at the El-Sarya School polling station," El-Masry, a lawyer, said. "The judge closed the station. He said he would re-open it, but he hasn't until now, so there are huge queues. No one really know what's going on,” she said. "This is very much a 'no' vote area. We're verifying the other locations now." 20:00 Supreme Electoral Commission Secretary-General Zaghloul El-Balshi denies allegations by the Judges Club that judicial supervision of polls, mandated by Egyptian law, is incomplete. El-Balshi told Al-Ahram's Arabic news website that there was a possibility that an extra day would be allocated for balloting if large crowds continued to turn out at polling stations, but that would require a presidential order. The most common violation, the chamber reported, was the appearance of Muslim Brotherhood members inside polling stations in order to persuade citizens to vote in favour of the draft constitution. This violation was committed at polling stations in Cairo, Alexandria and Sharqiya, among other governorates. The second most serious violation, according to the same report, is the collection of unstamped ballot sheets at polling stations in many governorates. Unstamped ballot papers are invalid unless the judge presiding over the polling station signs them. 19:15 Egypt will not see a penny of foreign investments if its major institutions remain unformed and uncovered by a constitution, Abdullah Shehata, the head of the economic committee at the Brotherhood's Freedom and Justice Party, told Ahram Online. “The institutions will rise through the constitution if the Egyptians voted ‘yes’,” Shehata added. On Friday, the renowned Qatar-based Islamic imam, Youssef El-Qaradawi, said that voting ‘no’ in the ongoing polling in Egypt would cost the country a ‘big loss,’ as the attraction of investments would be hampered, especially $20 billion from Qatar. 19:09 The Supreme Electoral Commission extends voting period until 11pm due to the "high turnout." The commission had earlier today extended the voting period from 7pm to 9pm. Zagloul El-Balshi, the commission’s head, said that only a presidential decree can extend voting till the next day. 18:45 Outside a polling station in El-Hussein district, Old Cairo, 30-year-old accountant Mohamed Mahmoud walks with his wife and 2 young girls after he and his wife voted. Mahmoud speaks to Ahram Online’s Nada El-Kouny. “Neither a ‘yes’ or a ‘no’ vote will bring stability. However, voting ‘no’ is the lesser of two evils in our case,” he said. “I voted no because I also wanted to prove to the ruling powers and their supporters that they should not undermine their significant opposition. 18:32 Essam Sultan, vice president of the Islamist Wasat Party and a member of the Constituent Assembly, expects that more than 70 per cent of the Egyptians will vote for the draft of the national charter in the first round of the referendum. Sultan, a supporter of President Morsi, said on Facebook that he expects this rate to be even higher in the second round scheduled for next week (22 December). Sultan explained that he thinks that the majority of the Egyptians will vote for the constitution because it is actually "a good one," in addition to the fact that Egyptians want to complete the process of building institutions and achieve the goals of the revolution. “But the most important reason is the public reaction against political and media elites who dropped, last month, their masks of democracy and peaceful resistance,” said Sultan, accusing the opposition of being involved in violent attacks and allying with the remnants of the toppled regime. "This elite will need many years to cleanse and reintroduce itself once again to the people who only believe in peaceful and logical dialogue and refuse to lie. Many of those who were to vote ‘no,’ amended their opinion to ‘yes,’ once they saw the hysteria of the elite within the past 48 hours,” Sultan added. 18:05 Egypt's Judges Club's referendum monitoring room said that 26 polling stations in Cairo, Alexandria, Daqahliya, and Gharbiya governorates lacked judicial supervision. The club, which had announced a 90 per cent boycott by its members against supervising the referendum, said earlier, however, it would "keep an eye" on the voting process. The general assembly of the club had previously taken a stance against the referendum due to a previous constitutional declaration by President Mohamed Morsi that made him impervious to judicial oversight. The Supreme Electoral Commission had announced that over 7000 judges decided to break rank with the club and monitor Saturday's vote in more than 6375 polling stations in 10 governorates voting today. 17:44 The vote-monitoring hotline of the victims of torture rights centre, El-Nadeem, received a complaint from Saeed Hassan, a member of the opposition Constitution Party which is led by Mohamed ElBaradei, accusing members of the Muslim Brotherhood of assaulting him in Cairo. A large group of about 20 people from the Muslim Brotherhood attacked our four observers, who were taking photos of the queue outside a polling station in the working-class district of El-Zawya El-Hamra in Cairo. They dragged them to a microbus, took their cameras, beat them up and gave them back the cameras after deleting the photos. Brotherhood members drove the observers to the police station, where they tried to get them arrested, but the observers then filed a complaint against the Islamists for beating them up. 17:40 Women outside the polling station of Cairo Technical School in middle-class area of Manial are chanting “we will not leave” outside the doors of the station, reported Shayfeencom (We are watching you) movement, an independent rights group. Voters are complaining that they have been waiting for more than an hour and a half, as queues are hardly moving. Similar complaints have been witnessed by Ahram Online in a number of areas around Cairo, including Maadi, Shubra, and Matariya. 17:35 A member of the 6 April Movement has filed a police report against Gamal Saber, the coordinator of Must Be Hazem (Lazem Hazem), a group supporting former Salafist presidential candidate Hazem Salah Abu-Ismail. The 6 April member claims that Saber physically assaulted him while he was monitoring the voting process at Tawfikiya School in Cairo’s Shubra Al-Kheima district. Saber, head of the 2012 aborted presidential campaign of Salafist Hazem Abu-Ismail, was kicked out of the polling station ealier on Saturday as he invoked the anger of some voters after he accused a female television broadcaster of "dressing indecently", reported Al-Ahram Arabic news website. In Al-Imam Ali school polling station the majority of the voters are men over 40. The mood is very somber; people seem tired of long-wait and are complaining that this was not the case in previous polls. Some voters say they have been here since 9am and still did not vote, arguing polling should have been done over 2 days. Some angry voters shout in the queues that the one-day polling decision was taken "intentionally" by the government to deter people from voting due to overcrowdedness. Three voters at the polling station filed complaint with the police officer at the polling station demanding an extra station to alleviate over-crowdedness. 16:43 The Strong Egypt Party, led by former presidential candidate and ex-Muslim Brotherhood leader Abdel-Moneim Abul-Fotouh, issued its first referendum-monitoring report of the day. The party, which has called on Egyptians to reject the new constitution, said 3 types of violations were observed in today's referendum: the absence of voter names from electoral lists, the refusal of some judges to show their identification cards to voters (a right stipulated by the Supreme Electoral Commission), and the absence of entire lists of voters from some polling stations. The violations occurred in many provinces, the party said, including Cairo and Sharqiya, according to the complaints it received. 16:40 Acid-tongued Salafist preacher, Abdullah Badr was securely escorted by the police out of the city of Qaha in Qaliubiya governorate, which votes in the second round of referendum next Saturday. The ultra-conservative university professor, who had been invited by the Salafist Call movement to give a religious sermon in one of the city's mosques, was attacked by some worshippers who accused him of using the mosque for political purposes after he urged the crowd to vote ‘yes’ on the constitution. Badr, who is known for his relentless anti-liberal and anti-Coptic rhetoric, has been accused by some fellow Salafists of working as an agent for the now-dismantled State Security Apparatus, and is currently facing a court case for allegedly defaming well-known actress Elham Shahine on TV. 16:25 In defence of Egypt's new-found democratic experience, Essam El-Erian, deputy head of President Morsi's Brotherhood’s Freedom and Justice Party (FJP), launched, on his Facebook page, a scathing attack on Egypt's previous three presidents: Nasser, Sadat and Mubarak. “They killed our dream to have freedom, dignity, justice and social justice,” El-Erian claimed. 16:05 Gamal Saber, head of the 2012 aborted presidential campaign of Salafist Hazem Abu-Ismail, was kicked out of Tawfiqiya School polling station in Cairo’s Shubra Al-Kheima district. Saber invoked the anger of some voters after he accused a female television broadcaster of "dressing indecently", reports Al-Ahram Arabic news website. 15:55 In El Taleea Prep School in Sayeda Zeinab, a densely-populated working class neighbourhood in central Cairo, accountant Tarek Abu El Makarem told Ahram Online's Zeinab El-Gundy that he will vote ‘no’ to the constitution referendum because it gives no social insurance to citizens. He also said he did not like Morsi’s recent decisions to sack the prosecutor-general, place himself above judicial review, and protect the Shura Council from dissolution. 15:35 Presidential spokesperson Yasser Ali denied that President Mohamed Morsi has violated electoral law by casting his vote in Cairo Saturday morning, rather than in his hometown. In an interview with CNN, Ali said that the reason the president voted in Cairo and not in Sharqiya, as he did during the presidential elections, is that he changed his residence on his national identity card after he was elected last June. When the president voted at the Heliopolis polling station, human rights lawyer Hafez Abu Seda accused him of breaking the very law he passed a week before the referendum, which forbids people from voting outside of their registered residence. Abu Seda added that the Supreme Electoral Commission had confirmed that the electoral lists had not changed since the presidential elections. 15:25 Facebook has shut down two of Al-Gamaa Al-Islamiya's group pages on the day of the constitution referendum, media spokesman Mohamed Hassan Hammad told Al-Ahram Arabic news website. He accused the social media website of being being “racist" after they removed Al-Gamaa Al-Islamiya Shura Council page and the page of the Islamic group’s media office. Hammad further alleged Facebook frequently closes Islamic pages, basing its decision on the argument that the content of the pages conflict with its regulations. 15:20 The Egyptian Health Ministry reports four people are injuried since the start of the constitution referendum in Cairo, Alexandria, Sharqiya, and Daqahliya. 15:15 Back on the streets in Cairo's Heliopolis district, voter Shady Onson outside the Ahram Qawmeya School says that he will vote ‘no’ because he did not like the way the Constituent Assembly drafted the constitution. 15:00 So far there are no preliminary indicators of which way Egypt voted in the referendum, Freedom and Justice Party (FJP) member Azza El-Garf told Ahram Online, before adding that party's leaders have been closely following the voting process across different governorates through several operating rooms. El-Garf, who was also a Constituent Assembly member, added that there has been a high turnout of women at the polling stations, which will have a crucial impact on the outcome of the vote. “No one is guiding people to vote ‘yes’ or ‘no’...this is a good sign for a transparent and fair voting process. I hope it continues like that until the end of the day,” El-Garf said. 14:50 Voters in the upper-class district of Maadi took the opportunity to get stuck into a good book in their polling station queues, as both men and women waited hours to participate in the referendum. “It took me three hours to vote,” said 28-year-old Madiha to Ahram Online’s Dina Samak. “I have voted in all elections in the past two years and even though it is always crowded I have the feeling that this time it is less organised. Many people are complaining and elderly women are having to wait in very long queues to be able to vote unlike other times,” she added. The real point of the referendum, Madiha asserted, is about voting for the national charter or not but is rather about allegiances to the Brotherhood. “It’s about if we should let the Brotherhood rule the country in their own way,” she said, proudly showing her blue-tipped figure after voting against the constitution. 14:40 There is some confusion over 18 polling stations in Alexandria. According to Al-Ahram's Arabic language website the Supreme Electoral Commission shut down these stations due to a lack of supervision by judges. However, the secretary-general of the Supreme Electoral Commission Zaghloul El-Balshi denied these reports saying that all of Egypt's stations are functioning as normal - only one station Cairo's Rod El-Farag, he added, ceased functioning momentarily when a ballot box went missing. 14:30 Back in the voting lines, those in Cairo's middle-class district Daher believe turnout is not as high as in previous elections. “The queue used to stretch all the way down the street,” says 38-year-old French teacher Viola Tadros to Ahram Online’s reporter, Ekram Ibrahim. Police and military are working together to secure polling stations. Although the security forces are being friendly to voters, Ibrahim says they have not been very welcoming to the media. 14:20 There was an awkward moment at the polling station water cooler when Amr Moussa, founding member of opposition group National Salvation Front (NSF), ran into former Muslim Brotherhood supreme guide Mahdi Akef while they went to vote. Pictures of the two greeting each other and politely shaking hands in the New Cairo station that they both share were published on Al-Ahram Arabic news website. The NSF is currently the most prominent opposition coalition campaigning for people to vote against the constitution as well as condemning the Islamist-majority Constituent Assembly. The opposition group was behind many mass demonstrations against President Mohamed Morsi’s decisions, the Brotherhood and the referendum which they deem "illegitimate." 14:15 Ahram Online journalist Zeinab El-Guindy describes being thrown out of a polling station with two accredited election observers, as the atmosphere in stations becomes increasingly tense. “We were in Abdeen Secondary School for Girls polling station, downtown Cairo, when the judge chucked us out us, saying ‘you don’t need to supervise, we can supervise this.’ It felt like he was particularly targeting Egyptian press as a German journalist, also in the station, was left alone. The observers were registered with the state-run National Council for Human Rights - so have every right to monitor the situation. The judge, who was pretty jumpy, refused to let us take pictures or film anything, it was impossible to reason with him. What was he so eager to hide?" 14:00 The Supreme Electoral Commission orders that polling station number 18 at Rod El-Farag’s elementary school in Shubra, Cairo, be shut down after ballot papers were stolen. 13:50 Yet more violations are being reported as the voting continues into the afternoon. April 6 Youth Movement, who sent their own observers to polling stations, released a report documenting a series of offences including unstamped voting papers, absence of voting ink and judges to supervise the stations. There is some confusion over the identity of those supervising the polls. In Cairo’s Sayeda district Shubra Masr School, the report said, one of the employees said he was a supervising judge but refused to show his ID card to voters. Meanwhile in Sahwa El-Islamiya School in the Masera area, Helwan, one of the voters demanded that the judge shows his ID only to discover that he was a school employee. In the Dar El-Islam School in Cairo’s Matareya, posters asking people to vote Yes in the referendum were clearly on display, violating electoral rules which ban any campaigning inside the stations. Monitors from the movement also witnessed rigging in the Ahmed Zuweil School in the governorate of Dakahliya, while in Sharqiya, the group reported that the judge left the Muslim Brotherhood to direct the voting process. Members of the Salafist Nour Party were also seen directing voters to say Yes to the referendum in the Fatma El-Zahraa School in Alexandria. The group is expect to release a new report every few hours as the first day of the referendum continues. 13:40 Egypt's national Judges’ Club has set up an operation room to monitor the status of judges supervising the national referendum despite the fact that the club’s general assembly had decided to boycott the elections. The club’s secretary-general Alaa Qandeel explained that they still cared about the safety of the judges who had chosen to run the polling stations. 13:35 Heading North to Alexandria, the ultraconservative Salafists have been directing the electoral process in Mohamed Ali School after its employees failed to show up, says Al Ahram Arabic language website. Members of the opposition coalition, the National Salvation Front, reported that the Salafists in the Shatby district of the coastal city, were telling people to vote "yes." 13:30 As head of the Shura Council and Brotherhood member Ahmed Fahmy went to cast his vote in Nasseriya School polling station in Sharqiya, opposition activists from the Constitution Party, Wafd Party and April 6 Youth Movement raised banners reading “‘No’ to the Muslim Brotherhood Constitution,” reports Al-Ahram Arabic-language news site. It was not clear if this action took place within or outside of the campaign-free zone. 13:25 Elections observer Ibrahim Azizy has been detained by bearded men in a polling station in Belbes, Sharqiya, for videotaping clashes in front of the station, says Bothaina Kamel, activist and founding member of the monitoring and anti-corruption initiative Shayfenkom (We Can See You). 13:22 Moving East to the border with Israel there is a high turnout in Sinai Peninsula city Arish but low turnout in Sheikh Zwaid and Rafah, reports Al-Ahram Arabic-language news site. 13:10 Activist Aida El-Kashef has been arrested after she tore up her ballot in protest of the constitution referendum, at the Nasser Girl's School polling station in Cairo's Manial district. The judge supervising the polls filed a report against her and she was consequently transported to Misr Al-Kadima police station. 13:05 Moving South to the border with Sudan a judicial source tells Ahram Online that the turnout is high, with hundreds of voters queuing in front of Nasr Al-Nuba’s 40 polling stations. Surprisingly, the judge revealed “around 90 per cent of Nubian voters marked the ‘yes’ checkbox,” despite predictions that Nubia would vote overwhelmingly against the constitution. 13:00 BREAKING The Supreme Electoral Commission extends voting period until 9pm due to the "high turnout." 12:45 Peaceful voting lines in one area of Mahalla were momentarily scattered when an unrelated gunfight started in front of a polling station, Al-Ahram's Arabic language news website reported. When the unidentified thugs moved on, voting continued. 12:30 Independent Monitoring Coalition, an alliance of different NGOs observing the elections, reports more electoral violations, including polling stations opening late, fully veiled women not being asked to show their faces to verify their identity, campaigners influencing voters outside of polling stations and government employees stepping in to fill the role of boycotting judges. The NGO alliance, which includes the Mosharka El-Mogatamaeya (Social Participation), Cairo Centre and ACT, also documented incidences in two polling stations in the Nile Delta city of Mansoura, where members of the Muslim Brotherhood’s Freedom and Justice Party replaced the missing judicial supervisors. 12:15 Standing outside his Daher Cairo district coffee shop, 36-year-old Peter Ekram says even though his polling station is only 50 metres away he will not vote as he believes the ultimate outcome will be a yes, no matter how many people vote against the constitution. “My vote will not count anyway, they will do what they want. The civil war has already started yesterday in Alexandria...they kept killing each other throughout the night,” he told Ahram Online, referring to clashes between opposition and Muslim Brotherhood supporters outside Qaed Ibrahim Mosque. 12:00 Freedom and Justice Party leader Saad El-Katatni expressed his sadness at the news that members of his party died a bus accident late Friday night as they returned to Alexandria after participating in a pro-constitution demonstration in Cairo’s Nasr City district. 11:45 Scenes are tense in Hadayek El-Kobbain in the queues as voters tenatatively discuss the reasons behind their choice, reports Sara El-Rashidi. “I am going to vote no because there are things I don’t like in the constitution especially articles referring to women’s, children’s and human rights. The social freedoms in the new constitution are much worse than the old constitution,” voter Nermine told Ahram Online at the Ahmed Maher experimental language school in Hadayek El-Kobba. 11:30 Reports of electoral violations during Egypt’s first day at the polls are beginning to come in, says Ahram Online journalist Lina El-Wardani. Sami Yassin of the National Human Rights Council, who has been monitoring polling stations in Shubra, told El-Wardani that the Salafist Nour Party is campaigning for a Yes vote 200 meters away from polling stations, which is illegal. He added he saw two women wearing the full face veil standing in queues urging other women to say Yes to the constitution at Insar Serri School polling stations. Meanwhile, in Abu Bakr School polling station the voting cards were not stamped, added Yassin, explaining that the judges opened the ballot boxes and restamped them. Turn out is low, says Yassin . 11:25 Former MP of Cairo’s Nasr City district and co-founder of Adl Party Mostafa El-Naggar tweets that his ballot papers were not stamped, that others are not being stamped and that the water print on them is not clear at the Ibn El-Nafis polling station. 11:00 Moving North to Alexandria, Ahram Online’s Randa Ali is scouting out the long voting lines at Abbas El-Akkad station in the middle-class district of Semouha, after bloody scenes on the streets of the coastal city yesterday. Sarah and Magda, two Coptic sisters, said that they were very happy with the way the vote is being conducted and that it seemed well organised but added, in the end, the results will probably be rigged. “We voted no as the constitution is simply not good enough,” they said. Meanwhile two fully veiled women Mervat and Naglaa said they will vote in support of the constitution, after being influenced by Islamic scholars who told them to vote yes. 10:45 The Muslim Brotherhood have set up temporary offices outside one of the biggest school complex in Cairo’s Shubra district, reports Ahram Online’s Lina El-Wardani. Hunched over their laptops, Freedom and Justice Party members Ahmed Yoursy and Hisham Abdel-Raouf are currently helping voters to find their polling station, while urging people to vote “yes” to the new constitution. Yoursy and Abdel-Raouf said they are providing people with this service as most people in the area are illiterate and do not have the money to text their identity card numbers to the electoral phone service to locate the polling stations. When asked whether he is influencing people to vote yes, Abdel-Raouf said “If they ask for my opinion, I tell them to vote for the constitution." 10:30 Meanwhile there are lighthearted scenes in Cairo’s smart Maadi district despite hundreds of men and women queuing outside National Language School and Maadi Secondary girls school polling stations, reports Ahram Online’s Dina Samak. “Boycotting would have been an easier choice," one woman jokingly said to her husband, who replied that it was easier this time than during the summer's presidential elections as "at least the weather was not as hot." 10:20 A bearded man standing at the entrance of Sakr Koreish Language School Polling Station in Cairo’s Ramsis district asks the queuing voters to say “Yes” to the constitution, reports Ahram Online’s Ekram Ibrahim. 10:11 The Egyptian Current Party, whose founding members are offshoots of the Muslim Brotherhood, have declared they are running an operation room where any violations or reports of rigging can be reported. The party has repeated its call for people to vote against the draft constitution. 10:08 Judge Zain El-Hawary of the North Cairo Court supervising the Sakr Korish School polling station in Cairo’s Ramsis district told Ahram Online why he didn't boycott. “I decided to take part in the constitution referendum because I believe that the judges should not be politicised." According to El-Hawary, the voting started at 8am and around 200 voters have already cast their ballots since the morning. The results will be announced at the end of the day, the judge confirmed. 10:05 Coptic Pope Tawadros II cast his vote in Cairo’s Waily district at the Al-Qoba Al-Fadaweya School polling station. Pope Tawadros assumed the leadership of the Egyptian Coptic Orthodox Church only last month. 10:00 President Mohamed Morsi voted in the upper middle-class district of Heliopolis today. Morsi, who is originally from Nile Delta governorate Sharqiya, is now registered at his new address in Heliopolis where the presidential palace is located. The president issued an electoral law stating everyone must return to their home districts and vote unlike last year's referendum on amendments to the constitution, where people were permitted to vote in any polling station. 09:45 At Mahmoud Fahmy El-Maamary School polling station in Cairo’s Daher district people are forced to wait as there are not enough judges to supervise the voting process: only one out of six judges turned up, reports Ahram Online’s Ekram Ibrahim. Voters began fighting with the police and the army, who are currently securing the area, to allow them to start the polls. They have been asked to enter five at time. Many judges have boycotted the referendum after President Mohamed Morsi’s contentious 22 November Constitutional Declaration made his decisions immune to appeal and was widely seen to take away power from the judiciary. “I am here to say no to the Muslim Brotherhood. I read the constitution and I am against child labor and the articles drafted about women rights. However, I expect the referendum results to be in favour of the constitution even if the people vote no”, Mohamed Marie, a Maths teacher in his late fifties told Ahram Online, adding that he feared there would be vote rigging. 09:30 Tensions are high at the polling stations in Cairo's working-class Hadayek El-Kobba district, as voters slam the media for, they say, misrepresenting those in support of the constitution, reports Ahram Online's Sara Rashidi. “I have already noticed a lot of aggression towards the media. I have just been attacked by a group of voters queuing outside the polling station telling me that I have come to this area to spread false news about those voting yes. They essentially called me a liberal traitor and propagandist so I have had to put on the veil, as I don’t think my appearance helps. This particular area is a working-class neighbourhood where the overwhelming majority were voting yes - they say the media has launched a campaign to discredit supporters of the constitution and the president. I only saw two Christian women and an old man who said they were opting to vote against the constitution." 09:20 In Cairo’s well-heeled district of Zamalek two long queues have already formed at the Faculty of Arts polling station. People of all ages have come to cast their votes, reports Ahram Online’s Zeinab El-Guindy. Activists campaigning for a "No" vote argued that the new constitution could allow child labor as the articles concerning children’s rights are too vague. They also maintained that the new constitution does not guarantee health care for all citizens. Meanwhile, Soha Amer, a veiled young woman in her thirties, told Ahram Online she will vote against the draft constitution. “The constitution contains no articles on women’s rights or on the equality of citizens. I also do not understand why the constitution would include an article allowing state and society to interfere in people’s morals and values,” she said referring to Article 10, which says that the State will guarantee the "genuine character of the Egyptian family" as well as "protect its moral values." 09:10 In Cairo’s Hadayek El-Kobba district, 100s are already queuing up at the Haroun El-Rashid School polling station reports Ahram online’s Sarah El-Rashidi. “The paper was not stamped. Some were and others were not so we shouted and they stamped our papers,” says Coptic voter Nabila, who was queuing with Nadia, another Coptic woman in her fifties, adding that she feared her vote would be invalidated. “We will not win,” Nabila said about those voting against the constitution draft but was reassured by Nadia who said: “We will. There is God”. Copts are estimated to make up around 10 per cent of Egyptian population, although no official percentage is recorded. The Coptic Orthodox Church urged its followers to participate in the polls but refrained from specifying whether they should vote yes or no. 09:00 The disputed national charter has been the subject of scrutiny by rights organisations. UN Working Group on the issue of discrimination against women in law and in practice, expressed their “deep concern” in a Friday statement, regarding the “equality, non-discrimination and protection and promotion of women’s human rights” in the constitution. They called on the Egyptian government to ensure non-discrimination and equality in the text. 08:40 Egypt’s Foreign Ministry has informed its embassies and consulates that expat voting will be extended until Monday 8pm. The decision to lengthen the window to vote was made by the Supreme Electoral Commission - expats were originally given until Saturday 8pm. 08:20 Campaigning on both sides went on into the early hours of the morning, with people distributing leaflets in support of the constitution or outlining key issues with the national charter. Revolutionary media collection Mosireen, set up last year to document the Egyptian revolution, have made dozens of videos outlining the problems with Egypt’s draft national charter, under the banner “Know their constitution." Speaking to experts, activists and victims of violence at the hands of the president’s supporters, the group have also used music and animation to create the series of short clips aimed at educating people about what they call the “Muslim Brotherhood” constitution. Key topics covered include the military, torture, the role of religion in the constitution, labour rights, health, Al-Azhar, housing rights and parliament, among others. "Today we say no to the constitution of blood and divison, no to the constitution of tyranny, no to the constitution of price increases and denial of the rights of the poor." “It's totally absurd that the [opposition coaliton] National Salvation Front blame the elected President for his opponents’ violence in Alexandria Friday." The FJP instead attributed “paid thugs and rogue revolutionaries” for the attack which saw at least 19 injured, as rival groups clashed in the coastal city after controversial cleric Ahmed Mahalawy urged voters to say “yes” to the disputed draft constitution. Ahram Online journalist Randa Ali in Alexandria, reported that Central Security Forces officers told her four bearded men had been arrested carrying knives. 08:05 More than 100,000 soldiers in amoured vehicles have been deployed to protect polling stations, government buildings and major cities, Reuters reported, ahead of the voting today. This follows violent scenes in Alexandria yesterday, when rival protest groups clashes and groups armed with swords and iron rods attacked an opposition forces protest. Egyptians return to the polling stations, Saturday, to vote on a controversial draft Constitution without full judicial supervision and following three weeks of bloody clashes between rival protests as well as strikes and mass rallies against President Mohamed Morsi after he pushed through the hastily written national charter. Opposition forces, under the umbrella of the National Salvation Front, have slammed the document, saying it will only enforce a presidential dictatorship, threaten rights and freedoms and leave the door open to an ultraorthodox interpretation of Sharia Law. The Constituent Assembly which drafted it, the front add, was unrepresentative of Egypt after several leftist , liberal and Church representatives staged a mass walk out. Supporters of President Morsi have, however, held huge demonstrations in support of the constitution across the country, maintaining that the draft national charter is necessary for a "stability" and a successful transition to democracy. Due to the lack of judges, after the general assembly of Judges Club announced they would boycott the polls, the referendum will take place over two stages: the first time this has happened since 1956. The first stage, Saturday, will include 10 governorates: Cairo, Alexandria, Gharbiya, Sharqiya, Daqahliya, Assiut, Sohag, Aswan, and North and South Sinai. The number of citizens eligible for voting in this stage is estimated at 26.6 million out of a total 51.3 million. Four of these (Cairo and the three Nile-Delta governorates of Gharbiya, Sharqiya, and Daqahliya) voted overwhelmingly against Egypt’s current Islamist President Mohamed Morsi in Egypt's run-off presidential election in June. Alexandria, the upper-Egypt governorates of Assiut, Sohag, and Aswan, and the border governorates of North and South Sinai voted 'yes' for Morsi without a large margin from his rival Ahmed Shafiq. The second stage, due to be held on 22 December, will include Egypt’s remaining 17 governorates, with a number of voters estimated at 24.7 million. The judges whom refused to supervised the pool should be considered them as non responsibe public servant, dont they feel ashamed?. You should resign. You are among the loosers. People have been voting since 8am and you are still reporting unstamped ballots as a violation??? The elections commission said hours ago that unstamped ballots will be counted. Why AO calls it a disputed constitution referendum. If the miniscule minority opposition including old regime's guards dont like it, it is not disputed. Please be fair reporter and not judgemental. What is the trends of voting result. Wow, could your commentary be any less blatantly anti-yes? Pro Islamic forces are under attack not only from so called seculariest & fellos but biased media and corrupt judiciary...They cannot stand much longer against will and determination of the majority of the pro islamic egyptian peopl...they only can fool themselve through such biased n negative coverage.